“The best laid schemes of mice and men…” begins the oft-quoted line by Robert Burns, with usually no need to finish with “…go often awry.” Most understand; we as humans make plans, and then life finds a way to complicate them. However, for trainees in medicine and science, planning composes a major requirement of our lives in both the immediate as well as the long term. How do we reconcile this contradiction? Those who can balance this struggle between order and chaos are the ones who do well in careers that require long-term planning as well as short-term flexibility. But for today, ask yourself this: If I could not come to work tomorrow, what would the consequences be? What about if you could not make it the day after tomorrow? The week or month after? For some of us, this thought experiment is very stressful, yet these questions need to be answered. For others, this experiment becomes reality. Two months ago, I was in a severe traffic accident. I am very fortunate that the ambulance driver noticed my ID badge clipped to my pants and took me to The Johns Hopkins Hospital for surgery — the work the care team did there was absolutely spectacular and I’m recovering at home quite nicely today. But the key phrase here is “at home” rather than “in the lab.” Which means out of the blue, I had to answer a number of pressing questions about how to cover my responsibilities, and unfortunately, I was firmly rooted in the group that found the above questions stressful. My boss was exceptionally helpful and understanding, as were my lab mates, who volunteered to cover my various roles, including significant mouse husbandry and other lab duties. The problem of my not planning for this type of situation remains, however; because I was forced to scramble to plug these gaps, my thesis project has been set back significantly and my responsibilities floundered before being saved only by the grace of my lab mates. 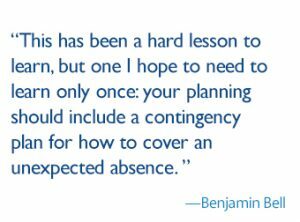 This has been a hard lesson to learn, but one I hope to need to learn only once: your planning should include a contingency plan for how to cover an unexpected absence. We already know life is full of curveballs, some of which may require stepping away from your job or school for a short or extended amount of time. A medical or mental health emergency, a sickness or death in the family, or even something more benign, such as being stuck out-of-town by a grounded airplane, is always a lot closer at hand than we like to believe. Having a contingency plan — which is different from the plans you make while scheduling an absence, such as a vacation or prescheduled medical leave — is one way to make sure that when an emergency arises, your research or academic duties aren’t left in a state of disarray. In the case of planned absences, you know specifically when and how long you will be away for, and can make specific plans for that stretch of time. But a contingency plan covers the unexpected. This should be a dynamic and accessible plan that evolves with your roles and responsibilities, to prevent your job (and your home) from being thrown into utter confusion if you unexpectedly cannot attend to responsibilities. Unfortunately, it’s a challenge for us to plan for the unexpected and uncomfortable to dwell on the possibilities that might lead us there. However, as our careers advance, our roles and responsibilities increase and diversify as well. As we embrace this increased importance, it becomes more essential to develop proper contingencies, so that we, and the people who rely on us, are not left uncovered and unprepared when the unexpected inevitably occurs. One Comment on "Anticipating the Unexpected: What is Your Plan for When Life Goes Awry?"